Sixteen-cylinder powering, complete individuality in style  that, in brief, is the story of the Cadillac V16. The sixteen-cylinder engine, designed and developed by Cadillac is wholly new and expresses fully the contemporary conception of brilliant performance. Cadillac-built in every particular, based on the solid, fundamental principles to which Cadillacs unmatched record must be credited, it carries these principles to new heights. It multiplies power and subdivides it into a continuous flow, constantly at full volume efficiency, flexible and instantly responsive  the ultimate triumph of Cadillacs famous V-type principle. For this engine Cadillac has designed a super-chassis, coordinating every unit so that the full potentialities of power and speed may be enjoyed as never before. The bodies are of many types, custom built and elaborately finished, and all highly individualized. Personal preference as in styling and colors can be fully expressed. The finish of panels, upholstery, fabrics, trim and other factors of style and beauty may be blended into distinctive expressions of individuality. Even major features of styling may be adapted to the individual taste. 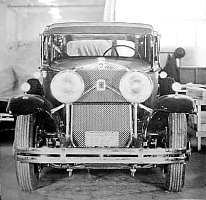 Cadillac, having priority use of the facilities of the Fleetwood Body Corporation, is the only car builder who can produce custom cars as complete unites under a single manufacturing supervision. scale drawings of custom-body types for the Cadillac V16 chassis. Most of the research for this essay was done by others more informed and authoritative than this writer. My sole purpose here has been merely to compile in one volume all the textual and pictorial material available on the sixteen-cylinder Cadillac automobiles. 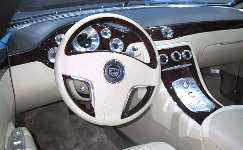 By laying before the readers in graphic or photographic form the myriad body styles that have graced the sixteen-cylinder Cadillac chassis from its inception, in late 1929, until its unfortunate yet logical demise in 1940, it is hoped to delight them with the inherent and lasting aesthetic beauty of some of the finest coachwork ever to grace an automobile. 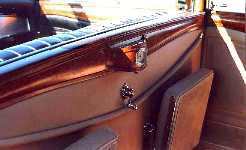 The photos, illustrations and line drawings on the following pages encompass not only the beautiful body styles built by the Cadillac affiliated coach works of Fisher and Fleetwood, but also the rarer and equally beautiful coachwork fashioned for the Sixteen by independent coach builders both in the United States and Europe. Simultaneously, and particularly with regard to Fisher and Fleetwood bodies, the booklet will be an invaluable reference tool for neophyte V-16 collectors/admirers; it will help them to visualize a particular body type when it is described merely by a job/style number. Conversely, by observing a certain number of the styling features of any sixteens encountered at old car shows, they will be able to surprise the owner(s) by determining the precise job/style number without looking at the body tag under the hood. The majority of line drawings you will encounter in these pages, used to illustrate the innumerable body styles of the Sixteen, have been copied or adapted from existing factory sales literature. Where such drawings were missing or non-existent, a montage was created, using composite parts of existing drawings, photographs and in some instances, pure guess work. In so doing, an attempt has been made to provide a visual representation of ALL body styles ever built on the V-16 chassis, including some unique coachwork, even where no photographic evidence or other illustration has come to light during my own and earlier research. Much of the photographic material in these pages is from the writer's own collection of Cadillac merchandising literature assembled painstakingly over the better part of 45 years. Some of it comes from other public and private sources which are to be credited for allowing their publication again in this electronic reference manual. This section of the database deals principally with the styling of the V16 models; but let's take a peek under the hood of a couple of sixteen cylinder models, nonetheless, to admire the two different power plants used to propel these awe-inspiring automobiles. The earliest V16 engine was fittingly described as ...a truly beautiful creation of bright chrome, polished aluminum, porcelain and gleaming metal. 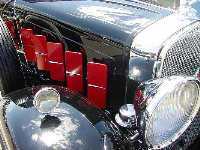 From 1930 until 1937, the basic configuration of the V16 engine (which underwent a number of improvements and modifications during these eight years) was an inherently balanced, valve-in-head engine of 452 cubic inches displacement incorporating hydraulic valve silencers. It was rated conservatively from 165 to 185 BHP (with the body installed and the car ready to roll). 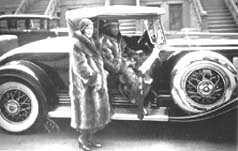 Depending on the type of body that was installed, the car was capable of speeds ranging from 80 to 100 MPH. To all intents and purposes, it consisted of two straight-eight engines mounted together in a V configuration at a narrow angle of 45°, on a single crankshaft. 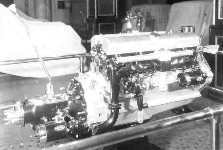 With a bore of 3" and a stroke of 4", this engine is commonly referred to as the Series 452 and is so named because of its volumetric displacement of 452 cubic inches. 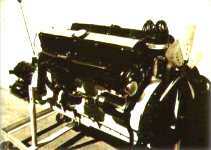 A new engine was designed for the Sixteens of 1938 to 1940. In the new design, the opposite banks of eight cylinders were set apart at an angle of 135°; this resulted in a much lower car profile in which the carburetors and carburetor air-cleaners could be mounted on top of the engine block. With a square bore and stroke equal to 3¼", the displacement of the second generation Sixteens now totaled 431 cubic inches. Again the rated BHP was a conservative 185 at 3600 rpm. These cars were not called the 431s, as one might have expected, but the Series 90. With the 16-cylinder model Cadillac has achieved at once the greatest sensation and the foremost engineering triumph of the season. This is the most individualistic and powerful car ever made for ordinary private use and every care has been taken to ensure that each detail of its construction is worthy of its amazing engine. It is indeed, the supreme achievement in motor car design - and at a price no competitor can equal. This 16-cylinder engine is built on the fundamental principles of design that have created the proud Cadillac record; its power, its efficiency, its flexibility put it in a position far ahead of all possible rivals. For such an engine a super-chassis was essential, and this Cadillac have built - incorporating the well-proved characteristics of Cadillac mechanism and giving perfect ride at even the very highest speeds. Madame X styles The rarest of the first generation Sixteens: the bespoke Madame X models with Fleetwood job/style numbers beginning "41..."
Coach Sill Styles This equally rare series of first-generation Sixteens have Fleetwood job/style numbers beginning "42..."
Raised Panel Hood The "cheapest" and most numerous Sixteens of the first generation are those with Fleetwood job/style numbers beginning "43..."
Exceptions These two "exceptions to the rule" have a Fleetwood job/style number beginning "44..."
Month-by-month Non-exhaustive table showing V-16 production by month, including job numbers, from January 1930 through February 1932. I had said that the 1934-37 V16 cylinder banks were offset at 90º instead of 45º! 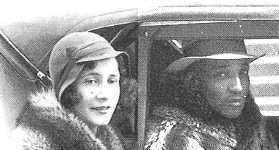 In the February 1965 issue of the Self Starter [magazine of the Cadillac-LaSalle Club, Inc., there are about 140 sixteens from, 1930 to 1940, listed as belonging to club members. In this regard, I should like to address a special word of thanks, here, to CLC member, Paul Ayres, who was kind enough to help my research on the V-16 by lending me more than 100 old Self Starter issues from the fifties and sixties. I have made reference copies of these for my own use and will gradually go through each one in the hope of finding and extracting useful information on survivors not included heretofore in the Database. That info will be added in due course. A NEW V-16 FOR THE NEW MILLENNIUM? 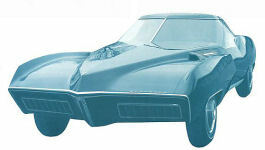 Cadillac enthusiast, Jerry McGovern, suggested in April of 2009, that I include in the Database the "stupendous" V-16 concept car that was unveiled in Detroit, in January 2003, by GM-Cadillac. 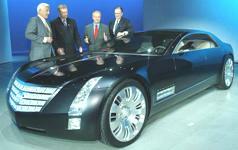 Detroit, Michigan - Cadillac unveiled its answer to the super luxury Maybach automobile in Detroit on Sunday evening. Aimed at "today's generation of exceedingly well-heeled customers of discerning taste," the rear-wheel-drive Sixteen has a 32-valve V16 concept engine that displaces 13.6 litres and produces 1000 horsepower and 1000 lbs.-ft. of torque. The engine is mated to a four-speed electronically controlled automatic transmission. The engine features fuel-saving Displacement on Demand technology, debuting in 2004 on some 2005 GM models, which shuts down half of the cylinders during most driving conditions and automatically and seamlessly reactivates them for more demanding conditions, such as brisk acceleration or load hauling cylinders when the driver needs the engine's full power. The aluminum hood is long, giving the Cadillac Sixteen tremendous dash-to-axle dimension; the wheel arches were designed to accommodate the huge 24-inch polished aluminum wheels. The four-door hardtop incorporates an all-glass roof and is without B-pillars. Crisp-edged lines of the midnight silver aluminum body panels accentuate the Cadillac Sixteen's striking appearance. The engine compartment features dual panels hinged about a center spine that runs the length of the expansive hood - the hood panels are power-operated. Seats are upholstered in hand-stitched, Tuscany leather, and the right rear seat features power adjustable slope to recline like a chaise lounge. Warm, hand-woven silk carpets the floor in a light cream colour that matches the leather upholstery. The dash, door panels, and front and rear consoles are trimmed with walnut burl veneer inlays. Electronic amenities include a rear-seat DVD information system, Bose sound system, and the fifth-generation OnStar in-vehicle safety and security communication system. "Cadillac's tradition is rich, but in the next several years it will be introducing vehicles as solid, dynamic and beautifully designed as anything it's ever done. And Sixteen is a harbinger of this new era," said Lutz.